with wings as eagles; they shall run, and not be weary; and they shall walk, and not faint. When we think of waiting, whether it is waiting in a car for a friend, waiting in a doctor's office for an appointment, or waiting in a check out line, we might tend to think of waiting as being a time of inactivity or passivity. After all, while we are waiting, we aren't actually doing anything... or are we? When we wait for somebody or something, we are actually in a posture of submission to somebody or something. For example, if you are waiting in a car for a friend, you have positioned yourself to be vulnerable to however long your friend takes to come into the car. When you are waiting in a doctor's office, you have given the doctor and his/her staff the power to choose who is next in line for their appointment. While we may see waiting as inactive, it is actually the opposite in many cases. For me, a self-described 'type A personalty', waiting can be very difficult at times. The longer I wait, the more I begin to scream on the inside for something to happen! For me, waiting isn't passive or inactive, waiting is one of the most active things I can do. 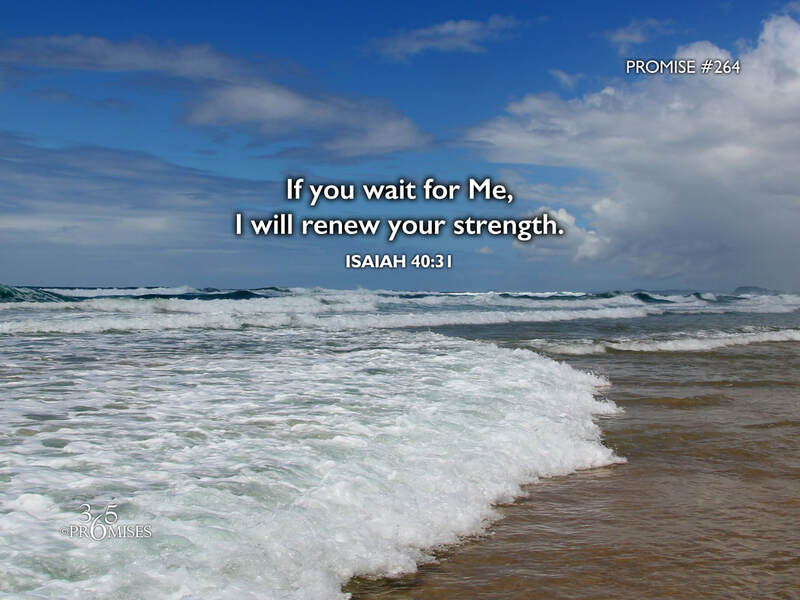 In today's promise, we read that if we wait on the Lord, He will renew our strength. When we choose to humble ourselves before Almighty God and acknowledge that it is His will and direction that we are looking for, we are positioning ourselves to wait for Him to give us the guidance we are looking for. When we wait on Him, we are honoring Him and choosing not to 'lean to our own understanding' as mentioned in Proverbs 3:5-6. Waiting on the Lord is one of the most active things we can do. It can be difficult at times because we are not in control of when and where God will move. We simply wait for Him to do what He wants to do, but the promise that we have today is that when we wait for Him, He will be faithful to renew our strength!